SUMMARY: An easy hike to beautiful overlooks. This hike is also know as Tarr Ridge, I prefer to use the name Jennifer’s Overlook. I did not name this hike and sadly someone removed the signs that used to mark this hike and made navigation easier. 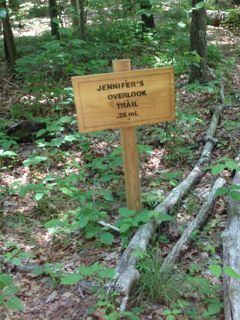 If you have some time, investigate why it is called Jennifer’s Trail, I cannot reveal all of the Gorge’s secrets here. The hike follows the top of a ridge line, and at different points you can stroll out and enjoy the vistas. I have highlighted four of the best vistas, but there are other vistas if you want to go find them. The easy stroll to the first two vistas places this hike on my list of favorites. Use extreme caution while enjoying this hike, especially if you decide to scramble up to either of the last two ridges to the last two vistas! RATING: Moderate Hike (about 4.0 miles.) The hiking is easy if you only visit the first two vistas, but there is a difficult scramble to get to each of the later two vistas that may require a rope. This hike uses unmarked trails and many people have trouble navigating the hike. This hike has scrambles/climbs that can be dangerous or deadly. 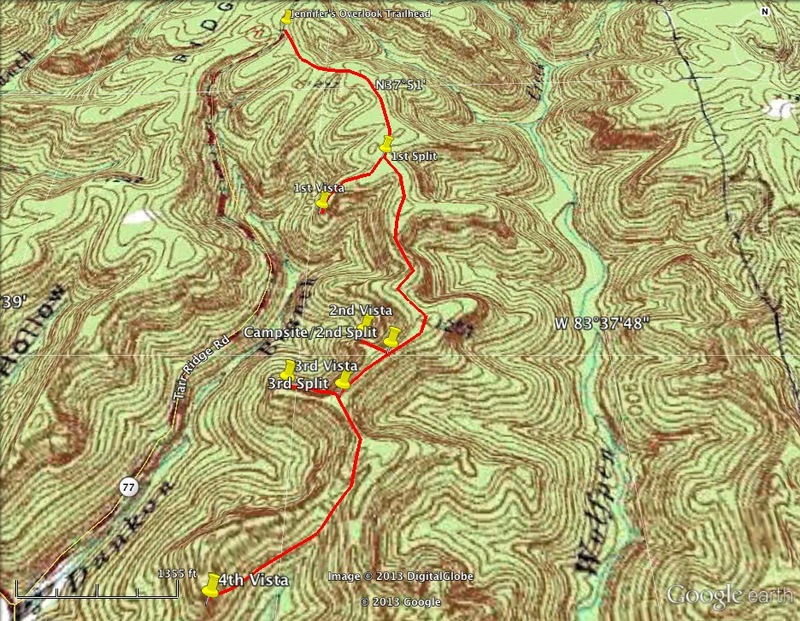 A quality map, compass and deep woods navigating skills are essential for your safety on this hike. Park in a pull off on the right side at the top of the hill. There is a large forest service sign. Turn right at the 3rd split and head out to the 3rd vista. (0.1 miles) To get to this vista it will require a scramble using a rope. If you are uncomfortable or not prepared turn around and enjoy the earlier vistas. Turn right and continue heading south on the main trail arriving at the 4th vista. (0.41 miles) To get to this vista it will require a scramble using a rope. If you are uncomfortable or not prepared turn around and enjoy the earlier vistas.